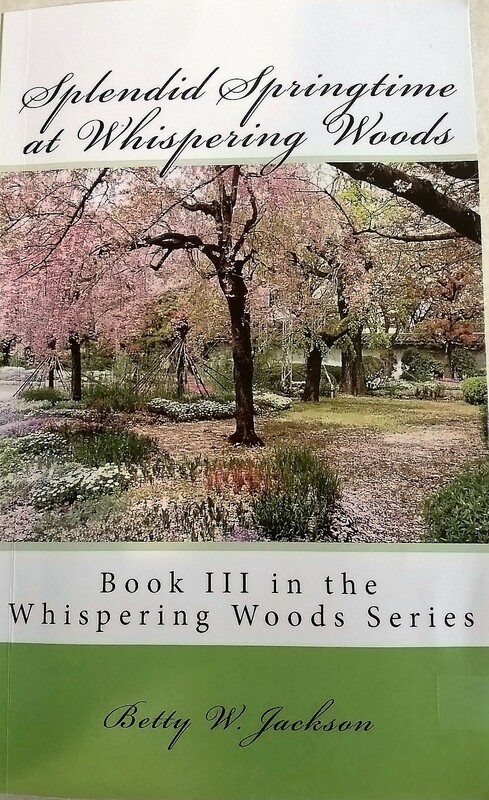 In this third book of the Whispering Woods series by Betty Whitaker Jackson, we continue the story of the New England resort/retreat center established by the Baxter family after they lost their homes and businesses on 9/11. In what they now call Godincidence, when one door closed, a better one opened, and their business is thriving. Book One deals with the renovations at the 160-acre estate. Book Two tells the stories of the family and their friends in Winter Wonderland at Whispering Woods. In this Splendid Springtime at Whispering Woods we meet new characters and budding romances, the true renewal of life at this remarkable place. A new campground is being built, a landscape business brings new life to the area, and several weddings in The Event Barn bring excitement and joy. Preparations for conferences, the establishment of training programs for therapy animals, a very popular petting zoo, and a garden area especially proposed for people with sensory and handicapping difficulties assure frequent visits to this special place. This author predicts readers will enjoy the positive atmosphere created at Whispering Woods where God is honored and people are welcome to share their life experiences and in return find refreshment and renewal at The Grand Lady Victorian Inn, The Event Barn, The Equestrian Center, The New Life Campground, The Railroad Cottage, and fantastic recreational facilities to bring families and friends together.